I have spent the day visiting with my stepmother Wendy. I met her current significant other, Larry, and we had a late lunch at a restaurant they like, where Brenda (my stepsister) also came. One thing we did was spend some time going through some old photo collections. 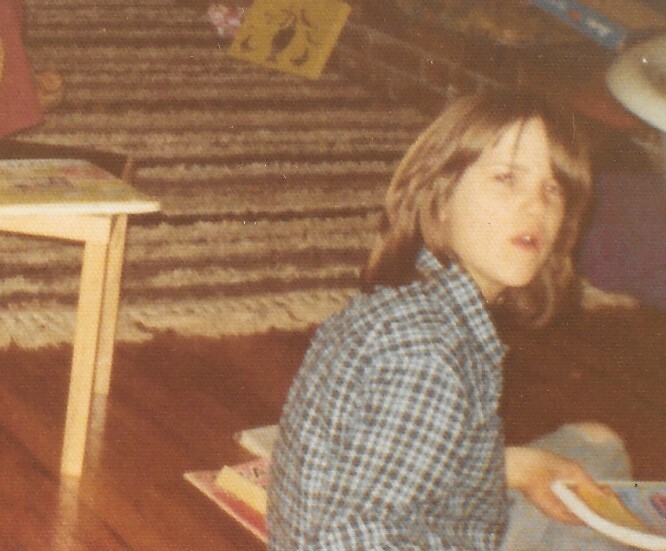 I scanned a few of them – so now I have digital versions of some old photos of my siblings and me. 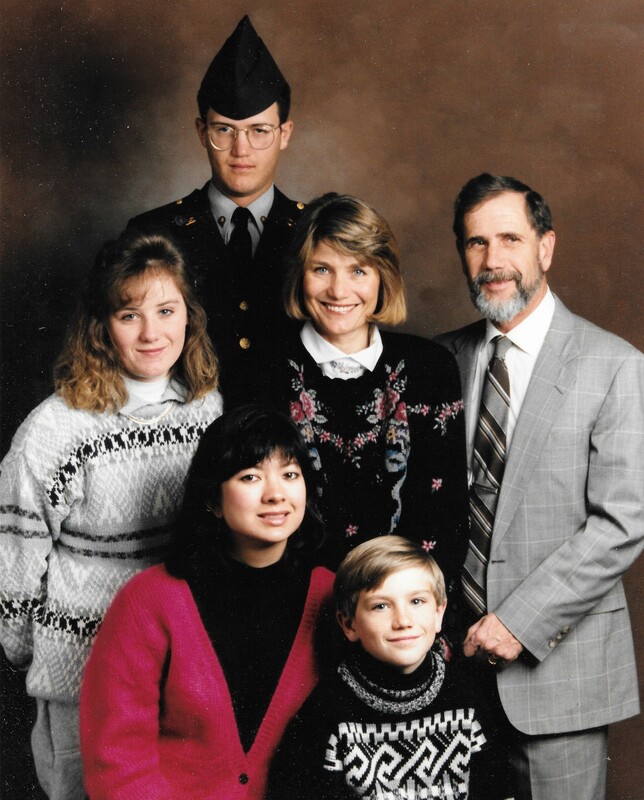 Here is a rare and implausible “family portrait” from 1990, when I had just finished the training phase of my brief Army career. Here is a picture of my father, looking rakish, and me, looking awkward. 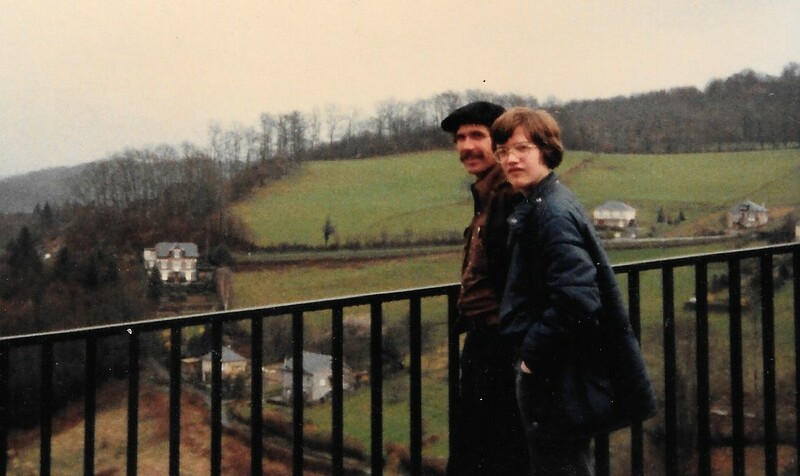 I was 13 years old, and we were taking a trip in Europe, in late 1978. Here is a picture of me when I was 11 years old, at Phil and Wendy’s McKinleyville house. I think it might have been my birthday. 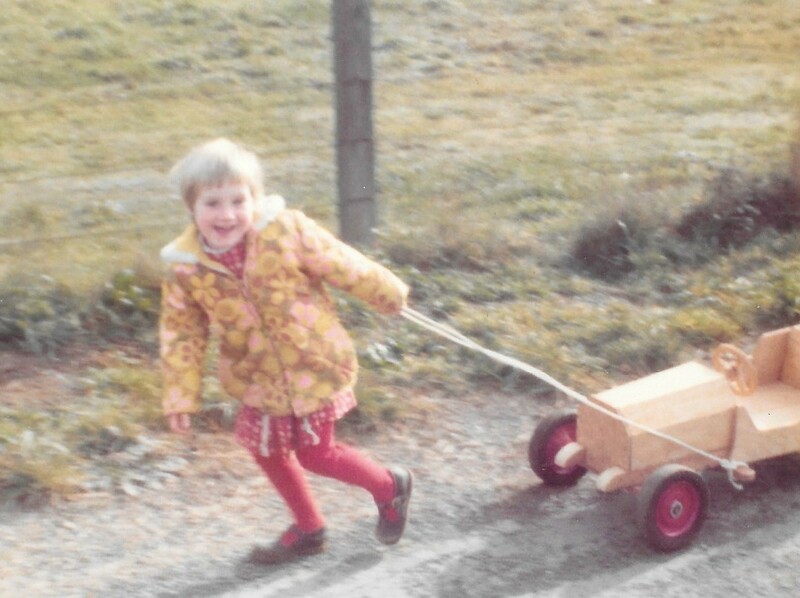 Here is a picture of my sister Brenda, age 5, pulling a go-cart that my father had made up the hill. 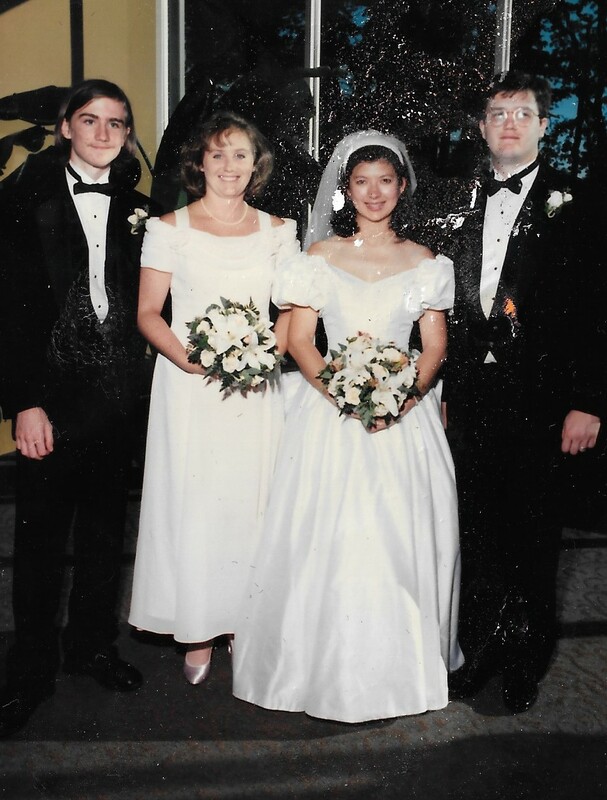 Here is a slightly damaged picture from my sister Samara’s wedding, in 1996: the four siblings. 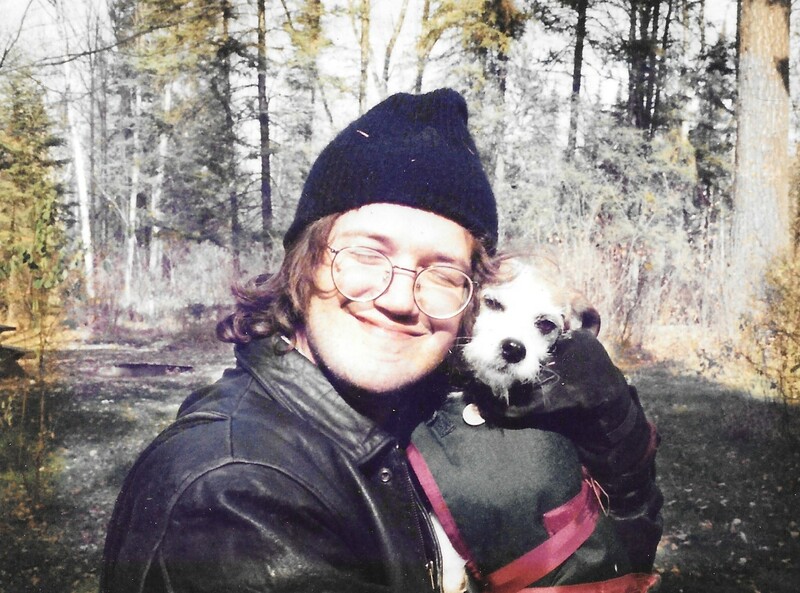 Here is a picture of me with Lucy the Dog from a camping trip to northern Minnesota in 1993 – the dog belonged to my friend Kristen in that era. 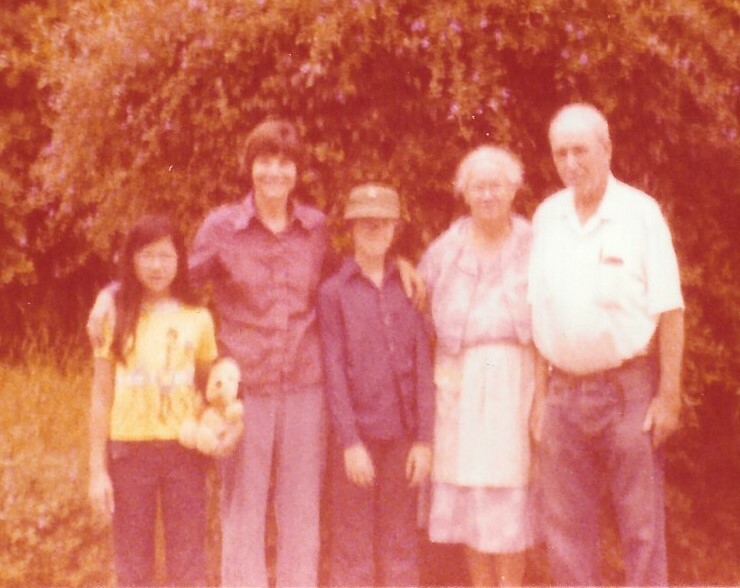 Here is a picture of Samara, Wendy, me, and my father’s parents Alice and John, from around 1975. Wendy and I took a short walk around her neighborhood and I took this panorama of Colorado’s Front Range looking west (you can “click to embiggen” this picture, you know). My stepmother has artistic talent. 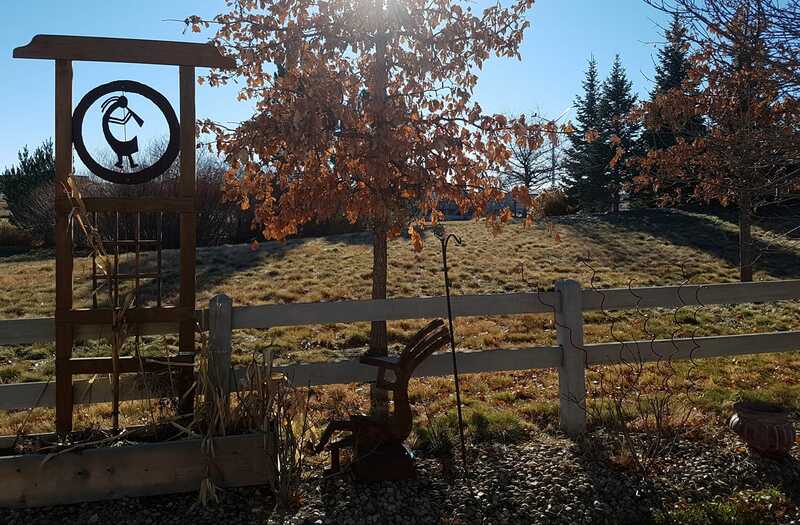 She made this kokopelli that is in her back yard. Did someone talk you into wearing that Army uniform in full in the 1990 pic, or was that your decision? You’re the first person who ever asked that, although I think I had to explain myself to my dad and Wendy at the time – a very perceptive question. I did wear it entirely voluntarily. That picture was taken literally days before my departure for my first permanent posting in Korea (December, 1990), and thus preceded the huge disillusionment and downright anger that developed during that period. I was actually rather proud of myself and my accomplishment. I’d been the perennial “98 pound weakling” in high school and college – bad at sports, in poor physical condition, etc. Basic and advanced training had cured me of that. I graduated at the top of my class in my AIT (advanced) training, which was only possible by stepping up not just in terms of the learning the skills required but also not just passing but exceeding the physical conditioning requirements. It was the very first time in my life where I felt I’d accomplished something significant – despite having graduated from University of Minnesota the year before. The latter had merely been an inevitability. Completing the Army training was actually an undertaking without a foregone success. Anyway, interesting thought. I’ll add this to my blog as a response, too.